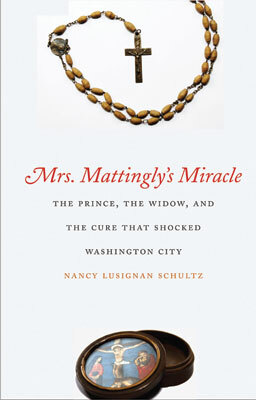 Author and lecturer Nancy Lusignan Schultz '78 received a National Endowment for the Humanities Fellowship and a Senior Fellowship at the Center for the Study of World Religions from Harvard University to research her most recent nonfiction book, Mrs. Mattingly's Miracle. In the Summer 2011 edition of Holy Cross Magazine, Schultz discusses her book's central characters: Ann Mattingly, who was mysteriously cured of a ravaging cancer in 1824-and a German cleric, Prince Alexander Hohenlohe, around whom a cult was arising in Europe. With insights into 19th-century American culture, the book poses questions of faith versus reasoning. In this Web Exclusive Q&A, Schultz shares more about her experience writing and researching the book, and her memories of Holy Cross. Q. While you were at Holy Cross, was there a professor who truly inspired you? A. So many in the English department! [Professor Emeritus] Thomas M.C. Lawler was a truly gifted teacher and my adviser in the English department, and he inspired me to become a professor. Q. There are so many good and bad stories about Prince Hohenlohe. What is your perception of his character? A. He was a human being, with all the attendant frailties. He was extremely charismatic, and that was his gift. Q. What were your greatest challenges during the 10 years of research you completed for the book? What was most rewarding? A. A couple of years before I finished the book, I gave a talk to my colleagues called "How Not to Write Your Next Book." It warned of the perils of taking on a subject that would strain the resources you had to complete the project, which was certainly the case here. This book was a hugely ambitious project for me to take on, with many challenges, including unraveling a long-standing Carbery-Mattingly family mystery. There were also hurdles with logistics and languages. In terms of logistics, my youngest son, Jonas, had been born in 2000, so he was still a baby when I started the project. That made it difficult to travel. The primary source material was in Washington, D.C., and in European archives. I was teaching full time at Salem State, became department chairperson in 2007, and I really didn't have a travel or research budget for the book. Language was another challenge in that the materials were in Latin and a half-dozen European languages. I double-majored in French and English at Holy Cross, but I was a very average French major. I took many courses with the late Rev. Alfred Desautels, S.J., who kindly encouraged me though I never excelled as a French student. I had a passing acquaintance with Italian, but the majority of the texts I had to read were in German. Q. What was most rewarding part of the process? A. I was honored to have been awarded fellowships from Harvard University's Center for the Study of World Religions and the National Endowment for the Humanities, which helped enormously with completing the project. I enjoyed meeting Mrs. Mattingly's descendants, many of whom have become my friends.